People living along North America’s West Coast are familiar with the Dungeness crab as a highly prized sport and commercial shellfish. 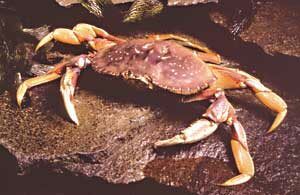 This crab, one of the 35 true crabs living in Canada’s Pacific waters, has the scientific title of Cancer magister. Freely translated, the first word is the Latin name for “crab” and the second means “chief” or “principal”. The common name “Dungeness” is derived from a fishing port near Puget Sound, Washington. A male Dungeness crab can grow to a maximum carapace or “shell” width of 230 millimetres (spines included), and weigh about two kilograms. 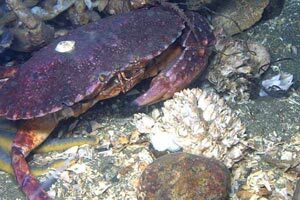 In heavily fished areas, however, few crabs wider than 190 millimetres are found. When alive, the main colour of both sexes is a blend of brown and tan. Two similar crabs – the rock crab (Cancer productus) and the graceful crab (Cancer gracilis) – may cause some identification confusion. Dungeness crab can be distinguished from red rock crab by its slender, light-coloured claw tips (the tips of red rock crabs are blue-gray or black), and from the graceful crab by its larger size and the absence of a small spine just past the widest point of the shell. Redrock Crabs are fairly common in the Pacific Northwest, and are distinguished from other crabs of similar size by the deep red color and black tips on their claws. They are good eating, like their relatives the Dungeness Crab, but are much nastier, and will pinch right through a neoprene glove if given half a chance.